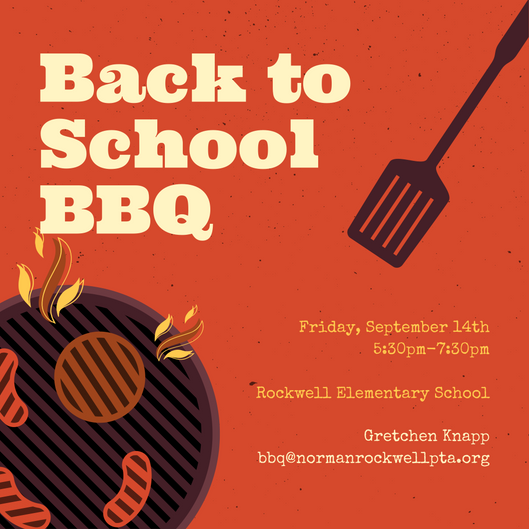 Please join us for our annual, all-school, welcome back barbecue! This is a great opportunity to meet your student's new classmates and families. Where: Rockwell covered and uncovered black top area near the gym. Food: Hamburger, Gardenburger or Hot Dog, Variety of Salads, Variety of Fruit, Potato Chips & Cookie. Tickets are $8 each and will be sold at the event only (no pre-sales). Volunteers Needed: Short volunteer shifts listed here . Come help us out! To volunteer at the school, you must complete the parent volunteer application. Click HERE to start the approval process. It can take up to two weeks to be approved, so do it soon!